S&K knows that you want to make sure you get the best price on items so you can pass savings on to your customers, while still making a great profit for yourself. We are announcing our NEW S&K Banner Club to do just that! Our NEW S&K Banner Club lets you get the same great banners you have known to love from S&K while letting you save on each printed banner. Becoming a member of our Banner Club, for $69.00 a year, can save you and your company money with each banner printed compared to our normal low prices! Banners purchased under our Banner Club are discounted by $0.30/sqft ( $0.69/sqft for less than 50% ink coverage and $1.69/sqft for more than 50% ink coverage ). This discount is $0.30 off for each square foot of your printed banner compared to our everyday low prices! The club also allows you to save 50% on each setup fee per order making the setup fee only $10 per order ( regular price is $20 per order )! Your savings will quickly add up and can more than make up the yearly membership fee with just a few printed banners with S&K! If you would like to add an even better deal to your membership you can add our Free Banner Shipping Club to your Banner Club membership for an additional $169. This Free Banner Shipping Club will let you get free shipping for each of your orders to one location of your choice, no matter the quantity of banners printed in your order! If you print 1 banner or 1000 banners, the shipping will be FREE ( to one location for each order )! 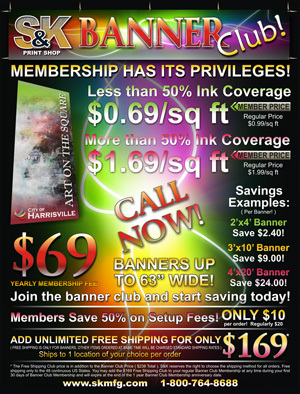 This additional club will save you and your business even more money with each additonal banner order. If you are ready to start saving money on your banner orders either call us now at 1-800-764-8688 or send us an email to: sales@skmfgprintshop.com. For additional information about this, or any other product we offer please contact us at 1-800-764-8688 or you can send us an email at sales@skmfgprintshop.com or visit our website at skmfgprintshop.com.